Click the TotalLength button to open the TotalLength dialog. 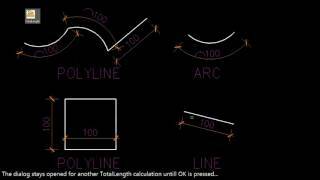 Check the types of objects to be included in the TotalLength calculation. Click the Select objects button to make a selection. The total length of the selected objects of the selected type(s) appears in the white field of the TotalLength dialog. It can be copied to clipboard. Click the Select objects button for another TotalLength calculation or the OK button to exit the TotalLength dialog.